Asking a group of Parisians where to find the best bread in the city is like throwing a match onto a pile of dynamite. Let’s just say nearly everyone in the City of Light has a very strong opinion as to which boulangerie is the best, and they’re more than willing to go to the mat to defend their perspective. What most can agree on, however, is that one of the most well-known and iconic boulangeries in Paris is the shop in the Saint German des Pres neighborhood made world famous by the late bread maker Lionel Poilane—aptly and simply named Poilane. 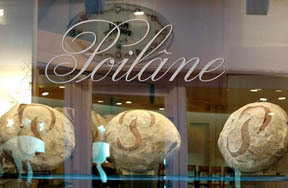 Poilane was born into a family of boulangers; his father started the Paris boulangerie in 1932, and specialized in using stone-ground flour, natural fermentation and a wood-fired oven. Lionel took over the shop in 1970, continuing his father’s reliance on natural ingredients and old-world baking techniques. In fact, the only modernization Poilane introduced to his boulangerie was a kneading machine. Everything else is done by hand. 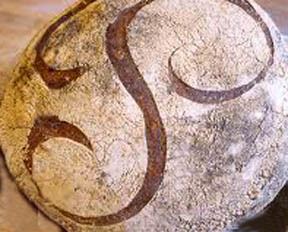 Poilane also developed the boulangerie’s signature product—a two-kilogram round sourdough country bread carved with the shop’s iconic “P” logo. Today, the bread—known widely as pain Poilane, although the official term for the load is miche—is not only the boulangerie’s best seller, but is recognized around the world as a symbol of high-quality French bread-making. Sadly, Poilane and his wife were killed in a helicopter crash in Brittany, France, on Halloween 2002. Fortunately for us visitors to Paris (and Parisian lovers of his wonderful bread), Poilane’s daughters, Athena and Apollonia, took over operation of the company and continue to produce the world-famous pain Poilane today. If you’re ever on Paris’s Left Bank and near Saint Sulpice church, be sure to take a short side trip to 8 rue du Cherche-Midi to buy a wheel—or even just a slice—of Poilane’s famous sourdough bread. 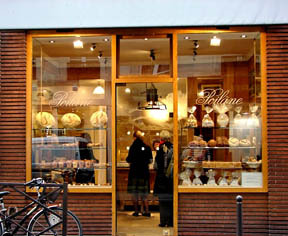 And then you, too, will understand why Poilane remains one of the world’s most renowned boulangeries. This entry was posted in Food, French cuisine, Left Bank, Saint Germain des Pres and tagged boulangeries, bread, Poilane by Bob Adams. Bookmark the permalink.